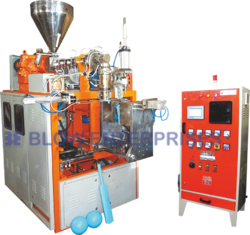 Fully Automatic Plastic Extrusion Blow Molding Machine. Specially Customized for long articles & kids toys industry. For higher output & lowest energy consumption. Features: Hydraulic Driven | PLC Controlled | Fully Automatic | 24" Mold Platen size for long articles | Inbuilt Sealing system | Variable AC drive for extrusion speed control. Suitable to make Plastic Articles in Blow HDPE; LDPE; PVC; PP; Raw Materials. Looking for Plastic Blow Moulding Toys Manufacturing Machine ?